An incredibly ‘life-like’ android appears to show how the line between woman and machine is starting to disappear. Footage captured at this year’s Tokyo Game Show has already amassed three million views on one video-sharing platform alone, but not everyone believes their eyes. A fierce debate has broken out among people who have seen the reputed robot with many believing it must be a person, while others think she is the genuine article. The alleged automaton, which some social media users have even admitted to ‘falling in love’ with the ‘pretty’ machine, was at the Japanese games convention to promote a PlayStation 4 game. A number of Japanese-made and international games are on display at the convention, which has been held annually for the last 21 years. The beautiful female ‘android’ stood out to many of the more than a quarter of a million gamers who attended, despite the fact she is only a PR prop. She along with several others of her kind were stood at the booth of Detroit: Become Human, a new video game developed by French firm Quantic Dream and published by Sony Interactive Entertainment. Visitors could be forgiven for thinking the apparently man-made machine was in fact a real-life human, as the video shows stunning build detail on her face and in the movements of her limbs. In the short clip, the ‘android’ smiles and waves, leaving expo-goers and social media users stunned. According to the game’s storyline, the humanoid robots promoting the game are state-of-the-art AP700 models, called ‘the most reliable android’. Twitter user Gareth Evans‏, who met one of her comrades at a separate games demo, said: ‘I met an android today. It/she was scary. The plot of ‘Detroit: Become Human’, set for release in 2018, revolves around android Kara, who escapes the factory where she was made. The upcoming game allows players to travel to the near-future metropolis of Detroit. The city has been rejuvenated by an exciting technological development: androids. You witness your brave new world turn to chaos as you take on the role of Kara, a female android trying to find her own place in a turbulent social landscape. The game promises to let you shape an ambitious branching narrative, making choices that will not only determine your own fate, but that of the entire city. The premise is that you discover what it means to be human from the perspective of an outsider, by seeing the world of man though the eyes of a machine. This is not the first time that ‘android’ visitors have made a splash at gaming conventions. 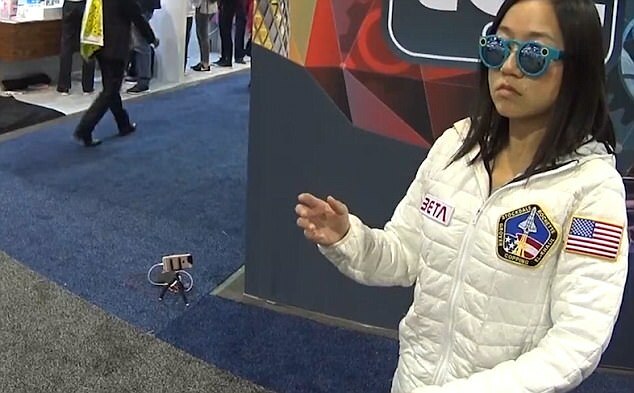 Karen X Cheng, a ‘viral video director’, went to the CES conference in Las Vegas back in January and pretended to be a robot. ‘I’ve done robot dances before as performances, but we thought it would be funny to do at a tech conference where people are expecting the latest in robot technology,’ Ms Cheng told MailOnline. ‘Honestly I wasn’t sure if we would be able to fool anyone, but we managed to convince a few people! Her friend pretended he was controlling her, with a remote attached to by a fake wire. After the wires were attached, people started to seem convinced, and even commented on how real her skin looked. The pair had to convince onlookers not to touch her to reveal the secret. At the end of the video, she surprises onlookers by taking off her glasses and laughing.